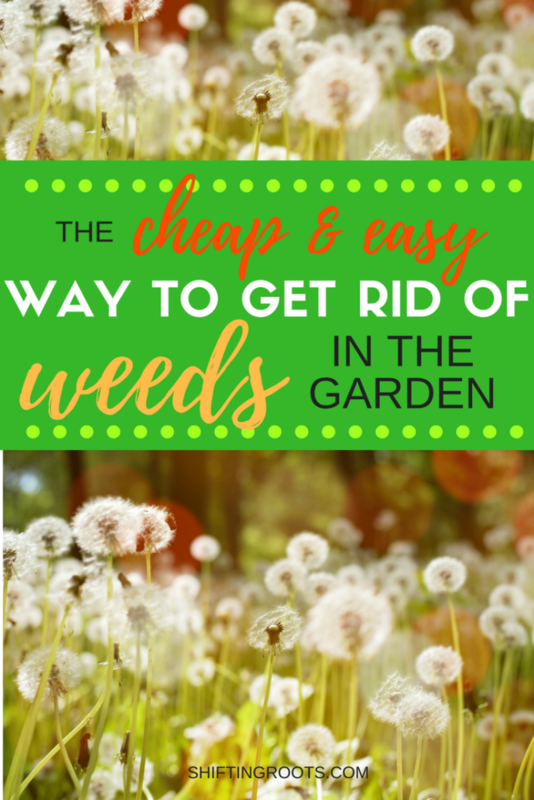 There are generally four ways to get rid of weeds: spray them with chemicals, spray them with a natural solution that usually doesn’t work that well, pick them for an eternity, or suffocate them. Actually, there’s a fifth way: Accept the weeds as your new overlord and use the useful ones in salads, herbal teas, and salves. I am not that kind of garden blogger, but there are lots of lovely ones on the Internet who can steer you in that direction. Anyway. I’ve tried all four methods, and the way I like the best and feel is the most efficient is to suffocate them. Best of all, it’s easy, requires little maintenance, and the equipment can be gotten for free or low-cost. It can also be expensive, but doesn’t have to be. . .more on that later. Want to feel better about the weeds in your yard? See the overgrown mess I started with, and how it looks now. Yes, there are still a few weeds that manage to poke their way through. However, they are super easy to pull and will be suffocated more when I add a new layer of mulch next year. Mulch is a material that is placed around a plant to enrich or protect the soil. In other words, gardeners put down mulch to suffocate weeds, retain moisture in the soil, and depending on the mulch type, add nutrients back into the soil. 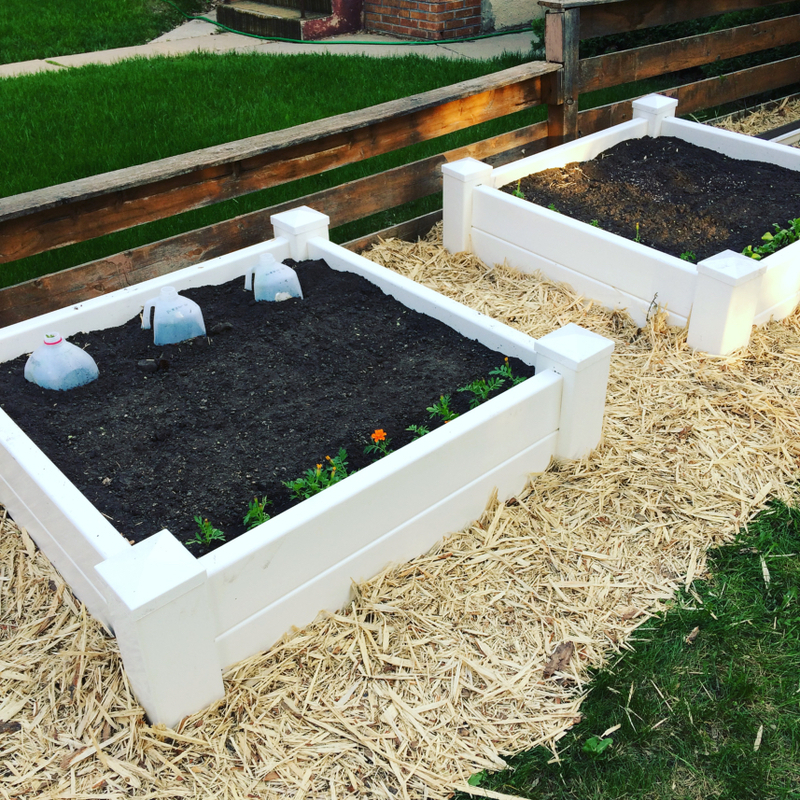 If you’re using mulch in the vegetable garden, wait until the plants are a few inches high so you don’t accidentally suffocate them. 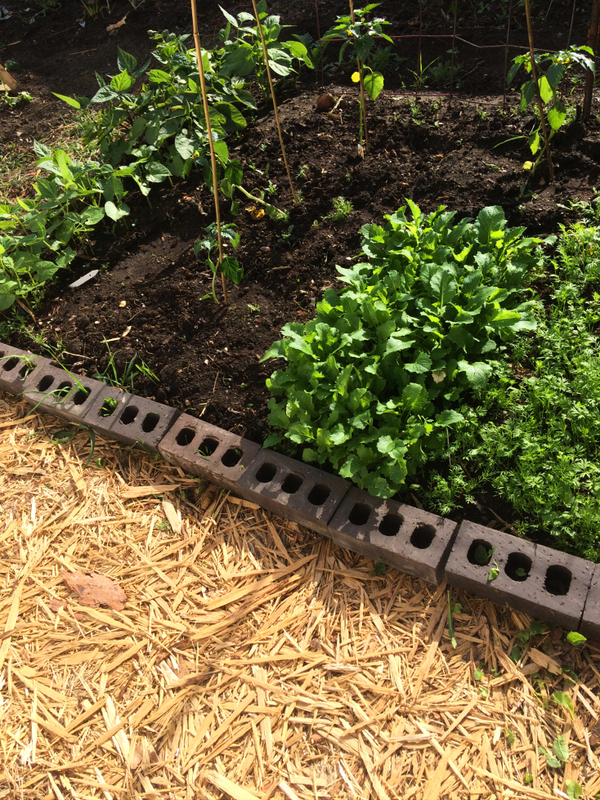 Once mulch is applied, any weeds that manage to creep through or grow on top will be extremely easy to pull out. Instead of weeding for hours on end every week, you’ll be able to weed for 5 minutes once a month, if that. Each of these mulches has it’s own pros and cons. For use in your vegetable garden, I recommend grass clippings (as long as they’re fairly weed free), leaves, compost, newspaper with no colour, and any natural wood chip product that is not coloured. If you are planning a landscaping project, you can use whatever product you like. Side note: While stone looks beautiful, you should also purchase a leaf blower if you choose that route. Over time, dirt, seeds, and leaves collect in between the stones, making your mulch look unattractive. You do not have to get rid of the weeds or grass first in the area you want to mulch if you’re creating a pathway. However, it is helpful and you definitely should get rid of any weeds if you’re mulching around your vegetables. Cardboard and newspaper are both effective, free, and will decompose into the soil–perfect for the vegetable garden! Using newspaper? Use at least 6 stacked sheets of newspaper and make sure the ends overlap. Water down the area and cover with a light layer of compost, soil, or other heavier mulch to keep the newspaper from flying away. Using cardboard? Remove all tape and staples and make sure your ends overlap. Cover with another mulch. 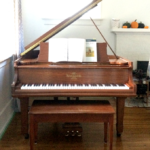 In this photo I’ve used natural wood chips. I love the result and the area has remained virtually weed free. Using Landscape Fabric? You get what you pay for, so use the highest quality fabric you can afford. 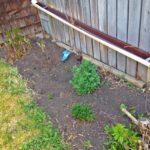 Landscape fabric is a pain to dig out and replace if you change your mind. Step Three: Lay Down the Mulch! I recommend using 4 inches. Anything less and weeds will be poking through in a month. Last year I bought mulch in bags and was disappointed with how little an area I could cover with one bag. I cheaped out and spread my mulch out to 2 inches–only to have all my weeds and nuisance ferns pop right back out a few weeks later. However, mulch doesn’t have to cost an arm and a leg. 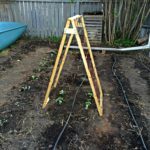 Falling in love with my vinyl raised garden beds? Get yours here! Landscaping fabric and bags of mulch from the store can quickly add up. Save money by using newsprint or cardboard as your first barrier. If you don’t have any lying around, grocery stores will often give you boxes for free. Make a quick call to a friend or post on kijiji and you’d easily have enough people offering you their old newspapers. Grass clippings and leaves are free and many people would be willing to give you theirs if you don’t have a lawn or trees. Tree removal companies often offer shredded wood mulch for free or low-cost. Just call ahead for a pick up time. Some will even deliver to your door if they have a tree removal scheduled for your neighbourhood. Hurray! You’re committed to using mulch in your landscape or garden. Here’s what you still might be wondering. . .
Can I lay mulch directly over my weeds? In short–yes. However, it’s much more effective to apply a barrier such as newspaper, cardboard or landscape first. Do I really need 4 inches of mulch? That seems like a lot. Four inches does seem like a lot of mulch, but you really do need that much. The only exception to this rule is when you are landscaping and you get close to a plant. In that case, you need to reduce it to 2 inches at the base. When should I add mulch? You can add mulch at any time of the year as long as any plants in the area you want to mulch are visible. A height of at least four inches is best. Is it really as low maintenance as it sounds? Pretty much! You’ll still have to pick out the odd weed or blade of grass, but it will come out easily. 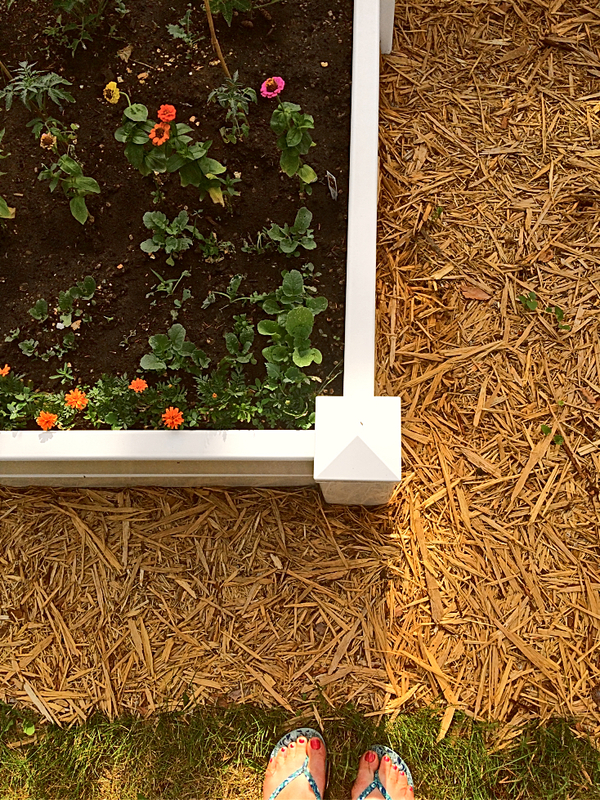 Unless you’re using rock or plastic “wood” chips, your mulch will decompose over time. Expect to top up mulches made with grass or paper at least once a season, soft wood mulches 2-3 years, and cedar mulch 5-8 years. 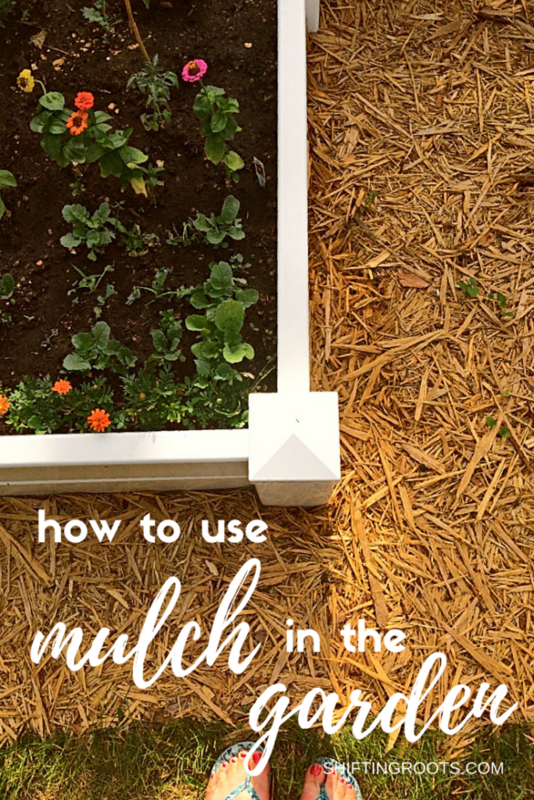 Will you use mulch in your garden? Where will you use it and what kind will you choose? Hi! I live in Saskatoon too, and just bought a house (getting possession this month!) 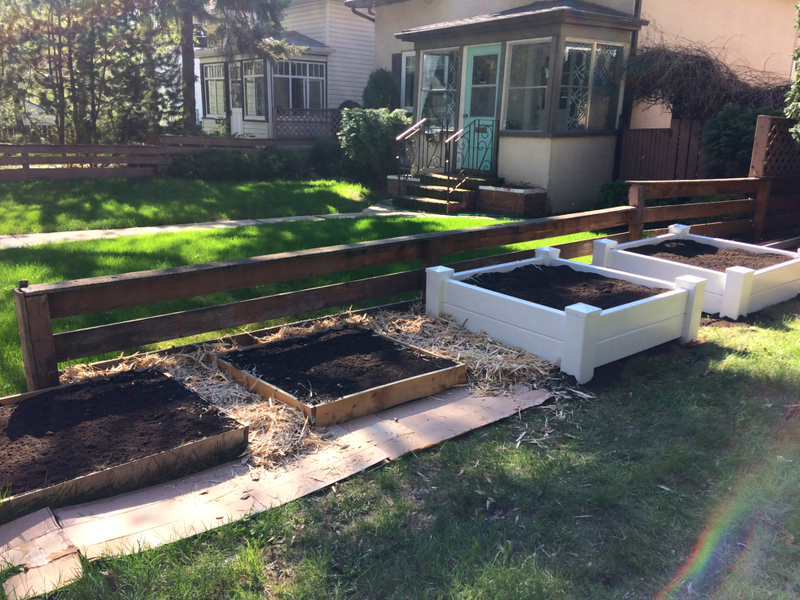 I'm excited to start gardening projects and I'm over the moon about finding a blogger from Saskatoon! Your stuff is really good and relatable! Where did you buy (if any) mulch from tree cutters around town? Just planning ahead and looking for good deals. Thanks! Hi Kim! Hurray! I'm always excited when people from Saskatoon or Saskatchewan find me. And congrats on your new house!! I got my mulch from Wilsons. I chose the cheapest stuff and it was $60 a yard, plus $80 for delivery. Worth it if you have a big project and no truck. All of the tree companies around Saskatoon sell mulch. I believe tree whisperer will sometimes do it for free, but I think most of the other companies charge $25-$50 a load and you must bring your own truck.